Did you know one of the main reasons for large pores is oily skin, your gender and age? 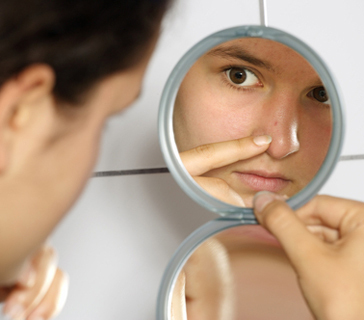 In fact, contrary to popular belief, it’s not acne that can cause large pores in the first place. It can develop in these pores at a later stage but cannot be solely responsible for creating them. Also, enlarged pores are not marks or scars left by acne, that is a complete myth. It is but obvious that to treat a skin condition, you have to first be clear on what causes it and one that has been identified correctly, as they say is half the job done. When you naturally have oily skin, excess sebum, pollution, bacteria, dirt and make-up residue can settle in pores and make them appear larger. Think of how your stomach stretches when you eat more food, in the same way, a normal sized pore on an oily person has the ability to enlarge as it’s holding more dirt and grime within it. As you may have guessed, the immediate skin concern to tackle is excess sebum on the your skin. Using a primer before applying make-up can act as a quick fix to ‘fill’ in those pores and give you a smooth surface to work on but it’s only temporary. You need to use products containing salicylic acid that will cleanse your pore from inside out, prevent breakouts and regulate oil levels on the skin’s surface. Naturally balanced skin will produce less oil and as a result, prevent pores from looking enlarged. However, the above is only a way to prevent pores from looking enlarged, acting as a preventative measure. If you want to correct the appearance of already enlarged pores on the skin which you may have developed from oily skin, age and genetics, an at-home Derma Roller or Micro Needling treatment is what will help you. What it does is that it works at resurfacing your skins texture and reforming it drastically. A treatment by a trained therapist (or yourself if doing at home) including a device with FDA approved and safe needles will literally be rolled to and from on your skin, tricking it to believe it’s injured. What then happens is that your skin automatically goes into repair mode where it creates a new layer of skin which is fresh, young, flawless and yes you heard us right, with shrinked pores! As mentioned above, you will give effective results which are guaranteed after just one Derma Roller treatment but you will have to take care of it by keeping skin balanced and oil free using the correct skin care products. You no longer have to be worried about enlarged pores, try and conceal it or scrutinise it in the mirror. With this Derma Roller Home Kit, you will be able to notice smooth and flawless skin in weeks. Enjoy making it up with Foundation or go au naturale and flaunt your new and improved skin!